In October 2017, we were pleased to offer an interview to Mr. Florin Dull for Business Magazine. About people, family and excellence. About Geseidl. When you enter the Geseidl office, you get a nice feeling. Do not imagine a glass skyscraper with supersonic lift and underground parking with voice command. We are in Ploiesti, in the center of town, in a beautiful house where, 14 years ago, an idea came alive. He then got roots, later to grow and become a positive example, a reference in the financial-accounting field, a notable presence in the branch and recognized by the national bodies for his merits. Stepping into the firm, you feel that unmistakable buzz about the job of an economist but, more than that, it is an atmosphere of positive concentration, involvement and passion. The 30 colleagues who meet each morning at Ana Ipătescu's office help over 150 companies to unravel embarrassment in various aspects of taxes and duties, mergers and acquisitions, auditing, management, accounting, payroll, human resources, leasing personal, IT, etc. Being able to help is, in fact, the satisfaction of well-being, and to identify your passion in the practiced craft is the only way to be truly fulfilled. At Geseidl we have always been talking about professionalism and continuous improvement, here being an open door for valuable people who have created the right environment for professional development. There are regular trainings, customer visits, there is and continues to be a precious amount of "hot" information and "cold" feedback, and every year the team has earned plus value through every man who came up with his personality, his expertise and his enthusiasm. Ms. Gela Popa, the founder of the company, had this dream, now called Geseidl, because, first of all, she always believed in people. He felt that everyone was good at something, able to do things for his own development through experienced people. He tried to be the right man in the right place. And for the members of the Geseidl team it was an example of power, organization and consistency. They felt so attracted to the financial and accounting field, being motivated by the company's manager, who inspired them to become more and more good every day in everything they do. Although physically, Ms. Popa is no longer present, she has remained the positive trajectory she has drawn with talent and continues to bear fruit. These are, first and foremost, highly professionally trained people who seek to help their clients and who also help themselves through a perpetual self-learning process. In the summer of 2003, the company began its journey. Four people with big soul and many dreams have focused their entire energy and professional experience on this project. In December there were already four employees and two trainees. Slowly but surely the wheels were moving and it was just the beginning. There has been a major investment in IT equipment, infrastructure, and then, over two years already in 2005, the quality management system has been implemented. Still two years later, Geseidl signed the 50th contract, a "milestone" that rejoiced everyone and confirmed that they were on the right track. The team has grown steadily by selecting young enthusiastic economists who are keen to learn from everyday practice at Geseidl, which firstly became a school-based firm. "Among other things, Geseidl is also a school that aims at excellence in accounting and human resources, through which we always want to bring value to the society in which we live, to give chances to young people, to open their way to success, and this is the thing that distinguishes us most of the competitors, "explains Robert Popa, manager of Geseidl. For many, Geseidl represented a nursery of specialists, some of whom later gained top positions in other companies. People are the soul of any business, and when you invest in employees, when you listen to their opinions, ideas, projects, then the real opportunities for the company open up. A motivated employee means satisfied customers and the company's management has known this basic principle from the very beginning. Every year several teambuildings are organized and, of course, informal meetings are held. Thus, the right framework is created in which people know each other better, open up their soul and load positive energy for their projects. There are sports, courses, workshops and team competitions are organized, new moments are held and gifts are given by the company, special moments are celebrated, both for the company and colleagues, personally. This particular time is given to man - not to the employee - and to his family. Surely, in life, everything goes away from a mission that everybody has it crafted. Why do we exist? "We, the Geseidl team, exist to make the world better! We care about those next to us! We want to help those who start a business, we want to be a real support to those who are committed and we want to give everyone confidence and confidence that they will achieve their goals in time, each time through the professionalism of our team. We've been looking for and always looking for the best solutions in everything we do to make life more beautiful for everyone, "says Robert Popa. The family has always helped us to remain anchored in the essential values of life: love, altruism, sincerity and perseverance in the work we do with our own powers. Geseidl found that middle way, a balanced framework, if we think of a firm as the place where we operate, where we practice - attention - what we like, but without taking the family out of the equation. Simply, personal issues can often be shared, some of which can be resolved, even with the help of the firm or colleagues. Transparency and sincerity have always led to the best solutions. Many times, in the business environment, there is a great gap between job and family, and the discrepancy is deepened by those in management positions. On the opposite side, there are cases where businesses are focused exclusively on family relationships. In neither of these extreme situations, the optimal level of emotional and professional "comfort" of the employees can not be attained. Exigency and professionalism have remained impressed with the Geseidl title, being a good omen for the bigger new projects that were on the horizon. In March 2013, the launch of the Geseidl brand, a milestone in the company, when the team realized that the company grew healthy, has grown a lot and it is time to work in other parameters. Among other things, a very well received project was implemented in Ploiesti, namely the Geseidl Association for Sport and Health. Given that team members are sport lovers and practitioners, the company has decided to actively engage in the local community, financially supporting projects, providing concrete support to athletes, and implementing their own ideas. And future plans go beyond the city's borders, the company intending to support sport for all, as a long-term investment in community health and quality of life. At Geseidl there is nothing to chance, everything being the result of many hours of work. But passion does not take account of outside weather, whether it's day or night. At the end, there is the joy of success and satisfaction that you have been useful to somebody, that you have helped, through your work, somebody. By extrapolation, it can be said that an accounting firm directly and indirectly helps a lot of people. "Having a very high responsibility, we can easily use it and help thousands of people. It depends on us if we choose to use this responsibility to bring a smile to their homes, a hope, a snap of security in an uncertain world, a ray of sunshine. They will never know about us and maybe we, too, "says Robert Popa. After only three years of activity, the company is certified by ISO 9001: 2000 by AJA Registrars, and in 2009 it obtains recognition from TÜV Rheinland. TÜV certification takes place around the time of the economic crisis, a time when the Geseidl team resisted and, moreover, managed to invest in IT and get out of the crisis. Proof? He won the first place among the accounting firms in Prahova County in 2009 for the second consecutive year. And so the ascetic began. The recipe has been preserved: hard work, without compromising on quality, but sprinkled with moments of respiration, team trips, family benefits and personal time. Time, this important factor - because excellence is achieved over time, but also with time. In the present case, as the company grew, employees became more and more confident in their own efforts. The management tactics adopted was a simple one, but with the expected effect: giving people trust and respect, and they will take care of the company's customers. Among other things, trust and respect are reflected in good words, career advice (or even personal), flexible work schedule, personalized training, or certain benefits, depending on the hobbies of each employee. At Geseidl, a very important place is for self-refurbishment. Learning is not a limited process, on the contrary, almost every day something new is being learned, in the context of everything moving extremely fast. Whether it is communication, accounting, human resources, IT or any other field, the tasks are solved "as to the book" according to the procedures and the letter of the law. For this, first learning is needed, and then deepening, updating. By definition, the job of economist requires you to be informed with all the legislative changes in the field, to have a daily update of the market and an overview of the Romanian, European and global economy. That's exactly what we find in each member of the Geseidl team, starting with the one who took over the baton from his mother, Robert Popa. F.D: Though thousands of tax and accounting firms operate on the Romanian market, Geseidl feels a special attitude, a wave of enthusiasm in a busy and even complicated business. How do you manage to print this status for the team? R.P: For us, Geseidl is not a job but a way of life. Our personal mission, of each of us, is to make the world better, to help those next to us ... it is what motivates us to live. Our hiring interviews are atypical, we are told almost every time, because we place great emphasis on each candidate's way of thinking and his vision of life. Once we find the person who has the same motivations as we do, we invite him to the team and from there everything is simple. F.D: Over 7 teambuildings took place in 7 years, it is an impressive number for a relatively small company. I have seen that you have moved with the team even outside the country. How much does it matter with colleagues and in what context is it best to do it? R.P: Right now we are back from a teambuilding! For us it is especially important to get to know each other and discover the potential of teammates. The first teambuilding we did in the second year of the company when we were 8 people. We have learned a lot since then, we have 36 teambuildings made today and many other similar but shorter activities. In a Geseidl teambuilding everyone has the chance to discover new things to others, especially from the coordinators, and eventually discover something about their own. Everything is surrounded by a cheerful atmosphere, a lot of fun and, of course, a lot of care towards each team member. Usually, Mrs. Popa was the one who cooked and we, the leaders, served at the table. It seems natural for you to give your colleagues how much you appreciate them and show them what you do to them, and love passes through your stomach, right? F.D: Is the Geseidl team relatively young, what is the average age? And how much does this matter matter in your work? R.P: The average age is 34 years. From the first day we considered that Geseidl is and must remain a school. It is one of the 4 ways we understand to make the world better for those next to us. Even if it's not always easy, we have maintained this policy, and our best and oldest colleagues are those who started their career with us right after college. In the 14 years of experience, there were more than 50 colleagues who debuted at Geseidl and then went on to Timken, Cameron, Michelin, Wabag, Lubbers or even as senior managers at multinationals. But in life everything must be in balance and, as the old Romanian saying says: "who does not have old people to buy", we are looking to have in our team and experienced people from which to learn the finer things. F.D: The family is at the base of Geseidl, and the employees form a large family in the company. Who is the youngest member of the team and how is communication with the eldest? Are there major differences of opinion? R.P: The oldest member, Geseidl, is 65 years old and youngest 24. A big difference at first glance, but he really does not feel. Those who have worked with us know this. We encourage direct communication without the hierarchy in the organigram. The very last quality audit, which took place three weeks ago, remarked our success: when you are in the middle of our life, you can not see who is the chief or subordinate. Moreover, those who are "subordinate" feel free to confront us. We have struggled to implement this attitude and we want to keep it constantly because it brings us a lot of benefits. F.D: What CSR projects did you run, which is closest to your heart and what future projects do you have in this regard? R.P: Here's one of the 4 ways we want to make the world better! We have at this time the Geseidl Association for Sport and Health, because we want to get involved as actively and efficiently in the development of the local community. We believe that encouraging mass sports is very important for the development of future generations, for everyone's health and a better quality of life. As an achievement in this field, I could mention the Geseidl football club, the GFC, and the Geseidl team with which we participated in 2008-2011 at local events and we managed to have a beautiful growth in the local mini-football championship. That's where we started and we realized there was a lot more to be done. We have supported and continue to support the athletic school club and the cycling and triathlon club. And as a future project, which we are working intensely now, is the development of sporting, neighborhood-free areas for everyone. 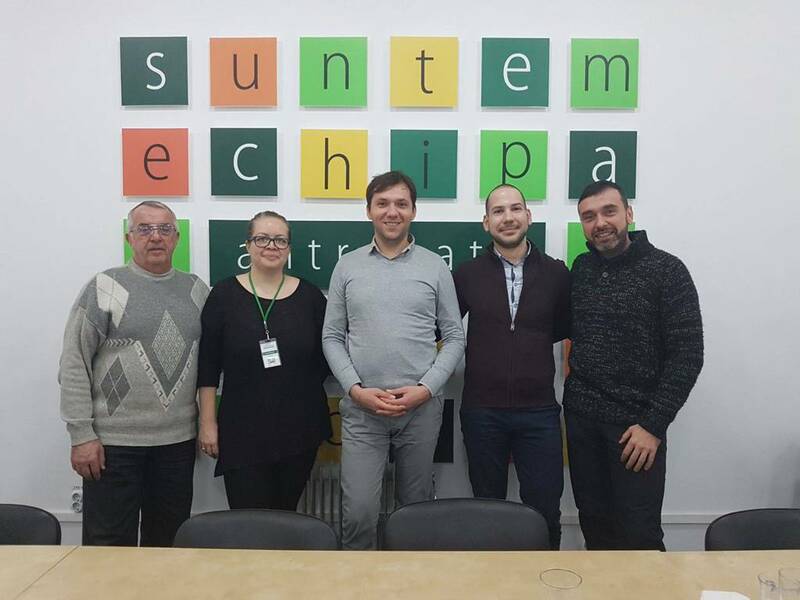 We develop a partnership with the City Hall of Ploieşti and foreign companies interested in CSR. F.D: To what extent is Geseidl involved in the local community? Are you just looking at Ploiesti or are you planning to expand your CSR activities to other areas? R.P: For now we want to develop mass sports in Ploiesti, where we are behind the other cities. A few years after we reach this goal, we will certainly go further. F.D: You have 3 children. What do you think are the dangers for the younger generation now? But the opportunities? R.P: It's a sensitive subject and where there's a lot to say. Personally, I am worried about the ineffectiveness of the current system of communicating to the young generation the pleasure to work and the satisfaction of the well done work, but I am unable to do a fair analysis. I think there are many dangers and potential skirmishes for the young. In Geseidl, the focus is on the family, first of all the family, above all, and then the Geseidl family. At home, in the family, we focus on "doing," we do not keep from "wrong" and never give up. I discovered that as my wife and I fall aside and let the children bloom, they immediately catch up with wonderful things. With little patience, every flower blooms in its time! Access to information, as it is now, in conjunction with consistency, desire to know, and perseverance, can not lead to a good outcome when the young man starts from a united and loving family. F.D: In the case of a general manager, can we talk about a balance between time for family and profession? What is this possible? R.P: Yes, for me there is a balance between personal family, profession and personal activities. There are two necessary ingredients: a successful family home and a successful family at work! A book written by Patrick M. Lencioni: "The Three Big Questions for a Frantic Family," and in fact about everything he wrote. "I lived," "I died," and "I resurrected" through his books. R.P: The Bible seems essential to me as a man, father and manager. Business related, a positive impact on business, family, and quality of life, for us is "Good to Great: Why Some Companies Make The Leap ... And Others Do not" written by Jim Collins. Our motto is "We're getting better every day in everything we do!" It is difficult for me to have a preferred quote because, depending on the discussion and especially on the person you are addressing, the quote should be chosen with care so that the message is transmitted as efficiently as possible. For me, today, Jim Collins' answer to the question, "Why Greatness? ", Is relevant as a conclusion to his book, "Because when all these pieces come together, not only does your work move to greatness, but so does your life. For, in the end, it's impossible to have a great life unless it's a meaningful life. And it is very difficult to have a meaningful life without meaningful work. Perhaps, then, you might get that rare tranquility that comes from knowing that you have a hand in creating something of intrinsic excellence that makes a contribution. Indeed, you might even get that deepest of all satisfaction: knowing that your short time here on this earth has been well spent, and that it matters. " F.D: What do you prefer to do in your spare time? Hobby? R.P: Learn! I spend at least a few hours a day studying new things, reading. I also like to do sports. I have a regular program of motion and combine cycling with athletics. And not necessarily as a hobby, but more like a healthy lifestyle. F.D: What would you do in a sabbatical year? R.P: I would study something new like Steve Jobs when he was fired and I would travel as much as possible for that. I would like to go back to Japan. Life seems very short and I do not want to waste my time. F.D: Is there a recipe for success? In your case, what is this? F.D: What would be a tip for young people? Especially for the undecided, who are outlining their future now, you are looking for a job, optimistic, but without experience and anxious. RP: It's hard to give advice ... That even means you know what you are talking about and it's a little bit too much for me, I'm still too young ... I come to my mind Someone very dear to me: "first look for God ... and all of you they will add to you! "